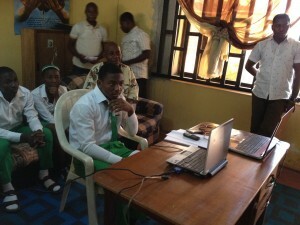 In a first-of-its-kind effort, twinned schools in the Lasallian Region of North America (RELAN) and the Lwanga District in Africa connected over Skype. This was the first time all RELAN schools twinned with the same Lwanga school connected at the same time. Students and faculty at the five RELAN schools twinned with Mount La Salle College in Naka, Nigeria, Skyped with Mount La Salle for approximately one hour on December 7, 2016. After praying together, Mount La Salle shared details on what life is like in Naka and what a typical school day includes. Then, students and twinning coordinators from each school had the opportunity to ask and answer questions, including sharing information on extra-curricular activities and service projects. Mount La Salle students take turns participating in the Skype. RELAN schools twinned with Mount La Salle are Calvert Hall College High School in Baltimore, Maryland; De La Salle “Oaklands” in Toronto, Ontario; De La Salle North Catholic High School in Portland, Oregon; La Salle High School in Pasadena, California; and St. Joseph’s Collegiate Institute in Buffalo, New York. 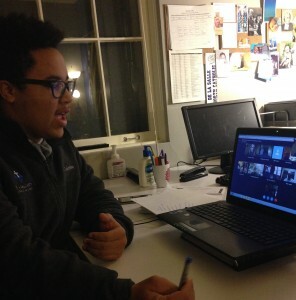 Taji Chesimet, De La Salle North Catholic student, participates in the Skype. “It was very enlightening to see communities outside of my school that relate to this Lasallian mission,” said Taji Chesimet, a ninth grader at De La Salle North Catholic. To connect with the RELAN schools, Mount La Salle used a laptop with an internet connection from a mobile phone and bought data for two phones in case the connection failed on one. The school used a generator for electricity since a public power supply was not available. Lwanga District Visitor Brother Ghebreyesus Habte, FSC, RELAN General Councilor Brother Timothy Coldwell, FSC, and Brother Kesiki Simon, FSC, with the Nigeria Sector joined the group.